When I think of choosing the right Bright Line Eating food scale it makes me think of the magical fantasy world of Harry Potter. That’s right. If you’ve seen any of the Harry Potter movies (or better yet, read the books), you understand that every witch or wizard needs a key piece of equipment. Without this one tool even the most gifted among them will find it virtually impossible to create and experience the magic. And what is this one essential piece of equipment? 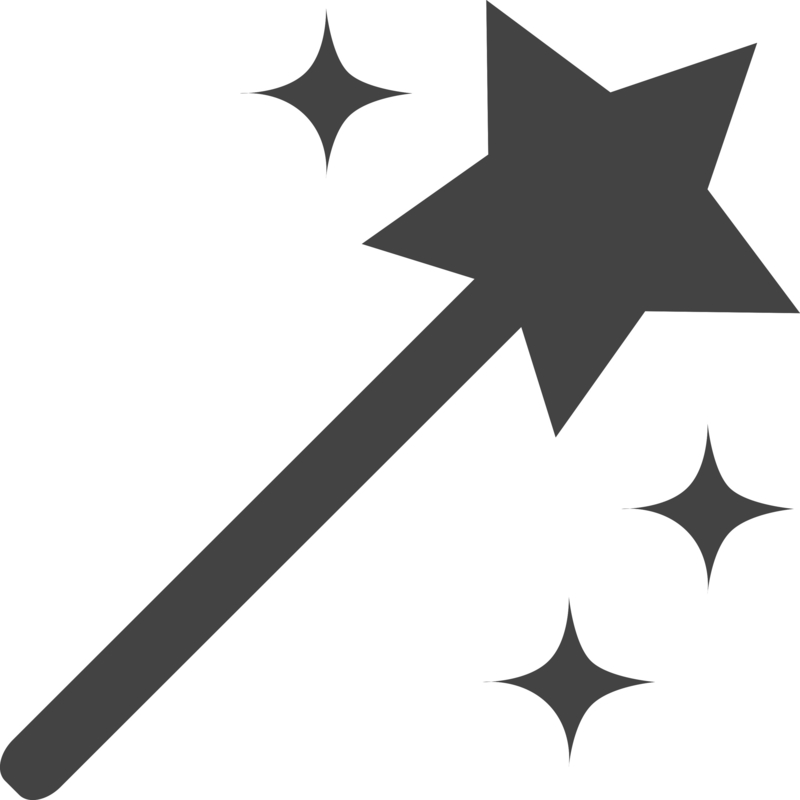 You guessed it – a magic wand! In the world of Bright Line Eating (BLE), your wand is your food scale. Without it, you’re not really doing BLE and you shouldn’t expect to experience the magic. But unlike the world of Harry Potter where the “wand chooses the wizard,” you do have to choose your Bright Line Eating food scale. So it is important that you do your homework and choose a food scale that is just right for you. 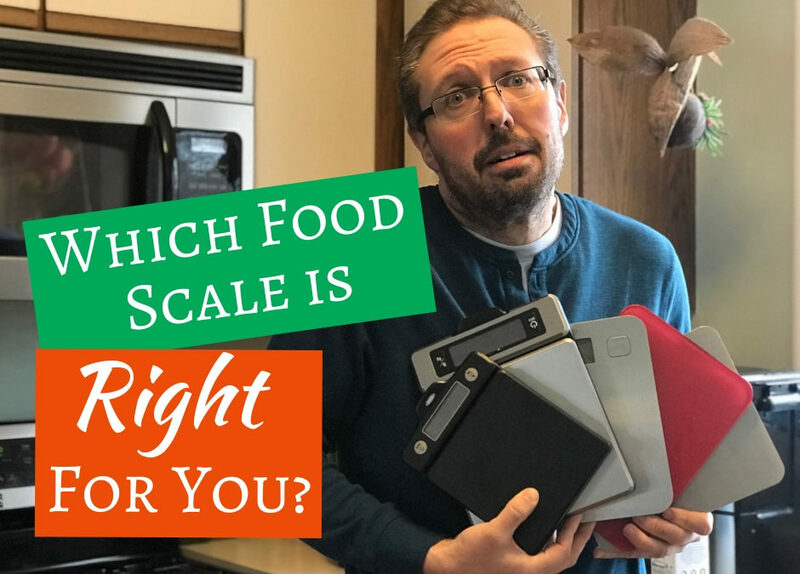 But with so many food scales on the market with different features and a variety of price points, how do you know which scale is right for you? Well, good news! I’ve put together this ultimate (some might even say, “magical”) guide to helping you choose the right Bright Line Eating food scale. Here you’ll discover the four absolute must have features to look for in every food scale. You’ll also find out which six nice to have features are worth the extra investment if your budget allows. And we’ll conclude with a review of three specific food scale models that are available at various price points. This is the absolute, non-negotiable feature you must insist on for any Bright Line Eating food scale. If you’ve got an older food scale with a needle instead of a digital display, DO NOT USE IT. Because even if it is in excellent shape, a needle is not as definitive as a digital display. And when you weigh your food, it is critical that you leave no room for personal judgement or estimation. Why? Because just that little extra mental effort required to interpret the position of the needle can actually inhibit healthy habit formation. The more mental effort a behavior requires the longer it will take to turn that beavior into an automatic habit. And Bright Line Eating works so well because it helps you establish eating behaviors that become more effortless and automatic. The next function you must have in a good Bright Line Eating food scale is a tare or zeroing function. 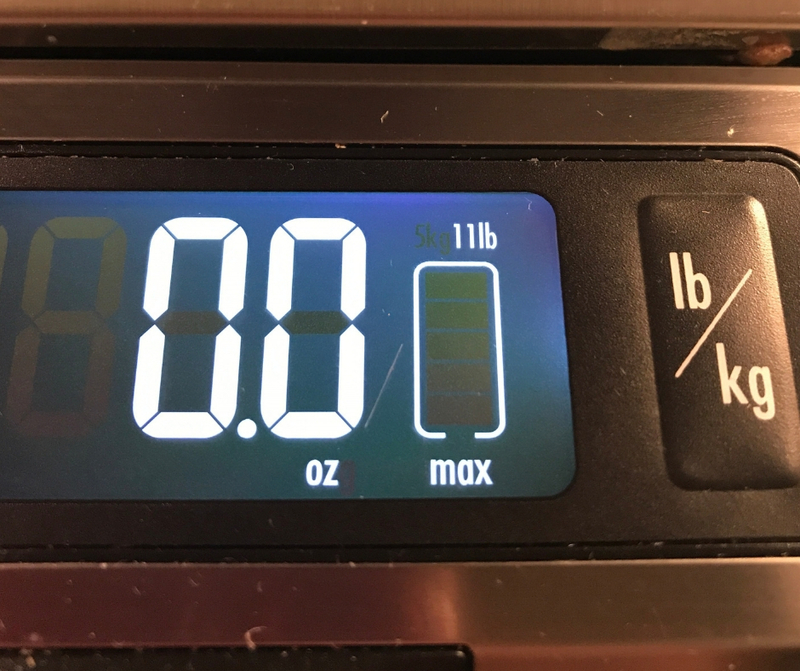 This function allows you to reset the food scale back to zero without removing items from the scale. For example, you can put a plate on the scale and then tare the scale back to zero. That way you can easily measure your food without having to mentally subtract the weight of the plate. This is especially helpful when adding a variety of foods to one plate like when making a salad. You can set your plate on the scale then hit tare. Measure your lettuce and veggies starting at zero ounces and then hit tare. Then weigh your protein from zero ounces followed by another tare. And finally, you can then weigh your fat (eg salad dressing) with the scale starting at zero again. A number of food scales on the market come with a bowl attachment rather than just a flat surface. And while this might be a great feature for some applications, it doesn’t work well for a Bright Line Eating food scale. Instead, you’ll need a flat surface that allows you to use plates and containers of all sizes. That way you can weigh the food in whatever plate, bowl or container you’re going to using. The last must have feature to look for in a Bright Line Eating food scale is at least a five pound weight capacity. No, you won’t be eating five pounds of food at any meal. However, you will often want to weigh larger amounts of food when making a recipe or storing leftovers. So invest in a food scale with at least a five pound limit and it should be able to handle most any task. In addition to the four must have features there are a variety of features that I have found to be especially helpful. Do you need these extra features? No, absolutely not. You can be quite successful at BLE without them. (I didn’t have all of these extra features when I lost my initial 100 pounds). However, if you’re looking to reduce the time and effort it takes to prepare your meals, you may find these nice to have features are quite worthwhile. What I can tell you is that the reason I like the AA or AAA batteries is that they are much more convenient to get your hands on. I can find them more easily at the store and I’m more likely to have them around the house. It is a very frustrating experience to have your food scale batteries die on you as you’re hungrily trying to weigh out your dinner. 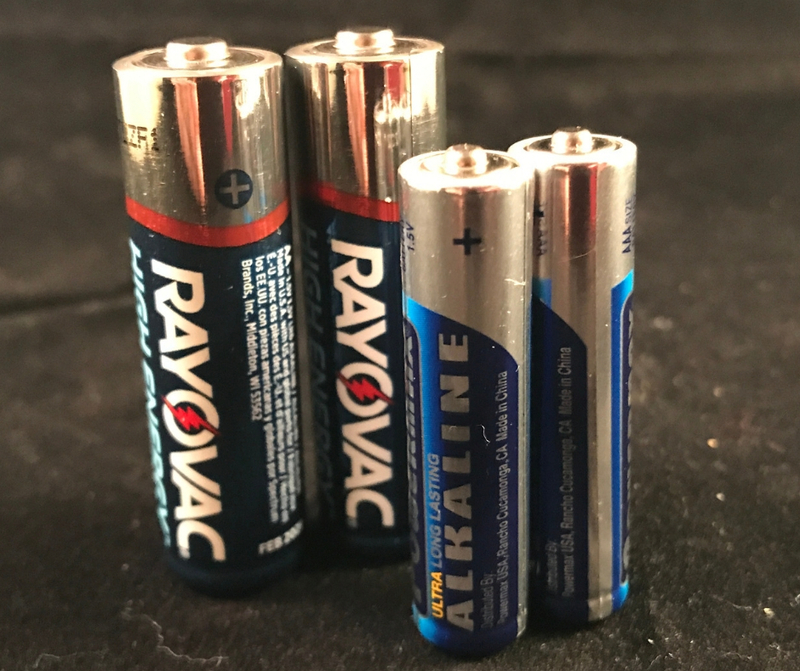 At least with AA or AAA batteries you can probably grab some out of the remote control or from one of your kid’s toys. Of all of the optional features available, this is the one that is most important to me. Most, if not all, of the acceptable Bright Line Eating food scales will come with an automatic shut off. This is a nice feature because it helps preserve battery life which saves you money. The problem is that most of these scales tend to shut off too quickly. It is no fun to be half-way through building your dinner salad and the scale shuts off on you. I like having at least ten minutes or more of time before the scale automatically shuts off. This will allow you to cut and chop salad toppings and add them to your salad bowl one at a time. Otherwise, you need to do all of your prep and chopping before you start to weigh out your salad. The disadvantage of prepping everything first is that it takes more time to do it. But sometimes you just need to quickly chop enough veggies for the salad you are going to consume immediately, and a longer auto-shut off accomdates this “prep as you go” nicely. 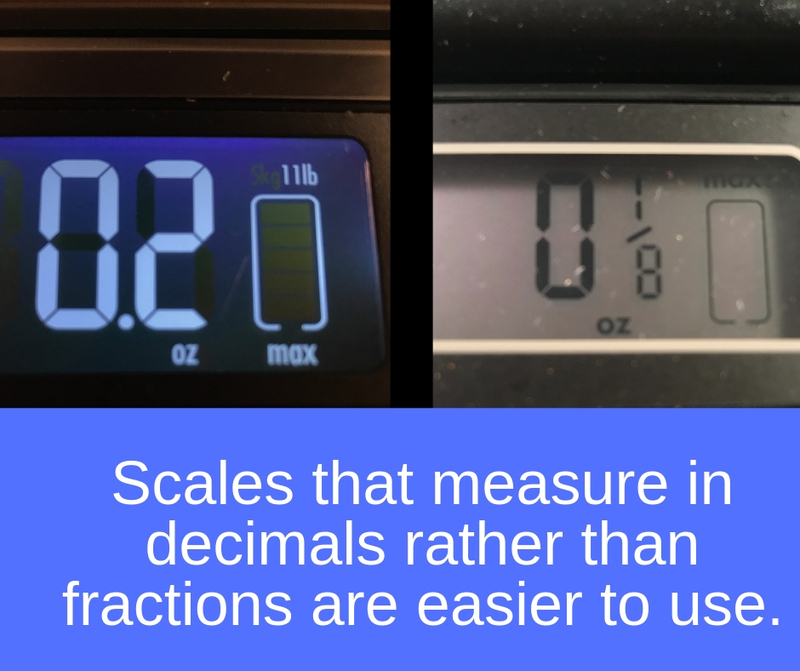 This one may seem like a no brainer, but there are a lot of popular food scales that do not have a completely flat surface. They tend to have a circular surface with an outer lip. At one point I ordered one of these because it was a best-seller and well reviewed. I ended up returning it because the outer lip prevented my plates (which have lip on the bottom) from laying completely flat. These models are probably a great option for a cook who needs to weigh specific ingredients. But for a Bright Line Eating food scale, I would skip them altogether. When it comes to weighing ounces, some of the food scales use fractions instead of decimals. In fact, the older model of one of the most popular Bright Line Eating food scales uses fractions. And that may not bother you, but I just find the decimals easier to work with than fractions. Partly because you occasionally want to get more precise than 1/8 of an ounce. For example, in the mornings I do nuts for my protein, but I like a variety of nuts and seeds. So with only two ounces of protein to work with, the decimal display makes it easier to monitor the small amounts of ground flax seed, sunflower seeds, etc. If you use traditional size dinner plates, one really nice features to look for in your Bright Line Eating food scale is a pull out display. Often your dinner plate will be much larger than the surface area of the food scale. This makes it difficult to actually see the numbers on the digital display without squating down or bending over to get the scale at eye level. But there are some food scales where the digital display can be pulled out from the body of the scale so you can easily see the numbers. As you’ll soon see, this feature does add some expense to the cost of your scale, but you may find the added convenience well worth the investment. Like it or not, any well used Bright Line Eating food scale is going to require a good cleaning now and then. No way to avoid it when you are weighing out your food at every meal. So you want a scale that is quick and easy to clean. Look for scales with a removable plate for easy cleaning. This allows you to use some elbow grease when necessary without having to worry about putting to much pressure on the scale or exposing electronic components to water. So now that you know which features to look for in your Bright Line Eating food scale, let’s take a look at some specific options. I’ve tried about a half a dozen food scales since starting BLE. I returned one or two right away because they were obviously not going to work well. And of the others I’ve tried, I’ve chosen three to review below. Each one hits a different price point and comes with a different mix of features. This should help you find a good option at whichever price point fits your budget. The Etekcity EK6212 is a great entry level Bright Line Eating food scale option. It comes with all of the must have requirements. It also has a particulary large surface which will easily accomodate a large dinner plate or salad bowl. And it was the most accurate of the scales I’ve owned and tested. This food scale comes with some other helpful features as well. It has a high eleven pound (5 kg) weight limit and an easy to read display. Also, it has a height of less than 3/4 of an inch (16mm) so it is easy to store. I also like that it comes with two AAA batteries and a one year warranty. And perhaps best of all, it is priced very affordably. My biggest complaint with this scale is that it has a quick automatic shut off. 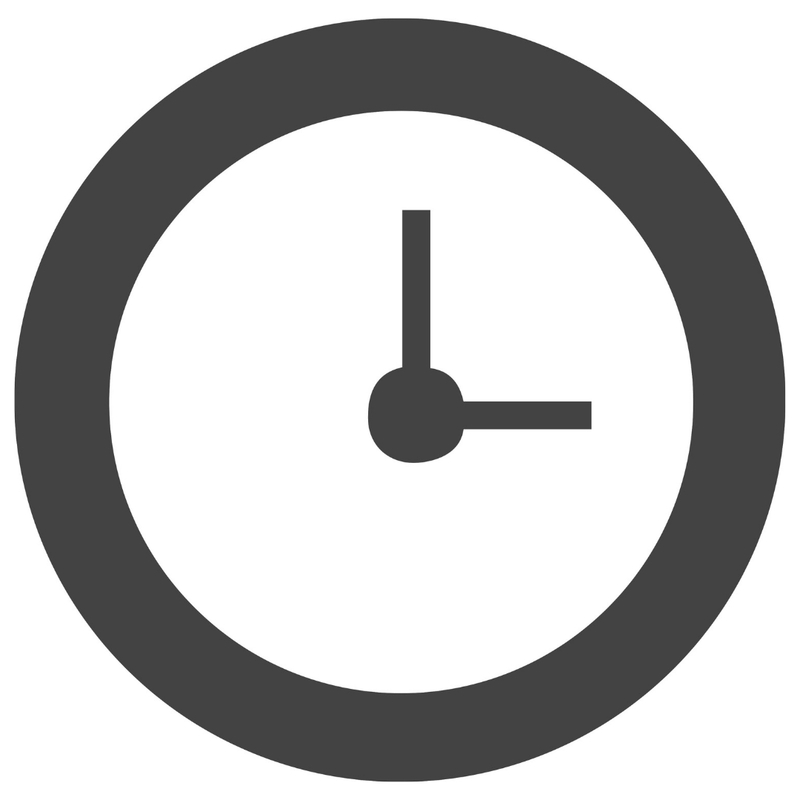 If you take more than two minutes between adding items to the scale, it shuts off. So if you get distracted or take too long chopping veggies, you have to start over. Bottom Line: If affordability is your top priority, the Etekcity EK6212 gives a lot of great features at a fair price. Next up is the OXO 1157100 digital food scale. In terms of Bright Line Eating food scale options, this OXO scale may give you the biggest bang for your buck. It includes all of the must have features and almost all of the other helpful features as well. The pull out display means no bending or squating to read the scale. It also has a detachable platform for easy cleaning. And it also ships with two AAA batteries and includes a low battery indicator. The OXO 1157100 also gives you six-minutes of inactivity before it shuts off automatically. I would prefer even more time, but this certainly reduces the odds that you’ll need to start over. In terms of the cons there are a few. First, as mentioned, I wish I had even more time before auto shut off kicked in. Second, it has a rather small platform area measuring 5.75 square inches (15 cm). (However, the smaller size is a perk if you’re looking for a good travel option.) And the biggest drawback, in my opinion, is that it weighs ounces in fractions rather than decimals. Bottom Line: The OXO 1157100 gives you a big bang for your buck with almost all of the features you might want in a Bright Line Eating food scale. The OXO Good Grips 11lb digital scale is my preferred Bright Line Eating food scale. It comes with just about everything you might want in a food scale. It has the pull out display, a large detachable platform for easy use and cleaning, a low battery indicator and it comes with the required four AAA batteries. I also love that it does not use fractions. But be careful, the previous and similar model of this scale does use fractions. In fact, that older model is still being sold and is often what others recommend as the preferred Bright Line Eating food scale. But my favorite feature is the generous auto shut off setting. After six minutes of inactivity the scale preserves battery power by going into standby mode. But you have an additional 24 minutes of inactivity before it shuts off and the memory is lost. So when in standby mode, all you need to do is tap any button and the display will return to its previous reading. No starting over! The biggest drawback of the OXO Good Grips 11lb is that it does require a larger upfront investment than most other models. Its larger size also means that it would not be an ideal travel scale. 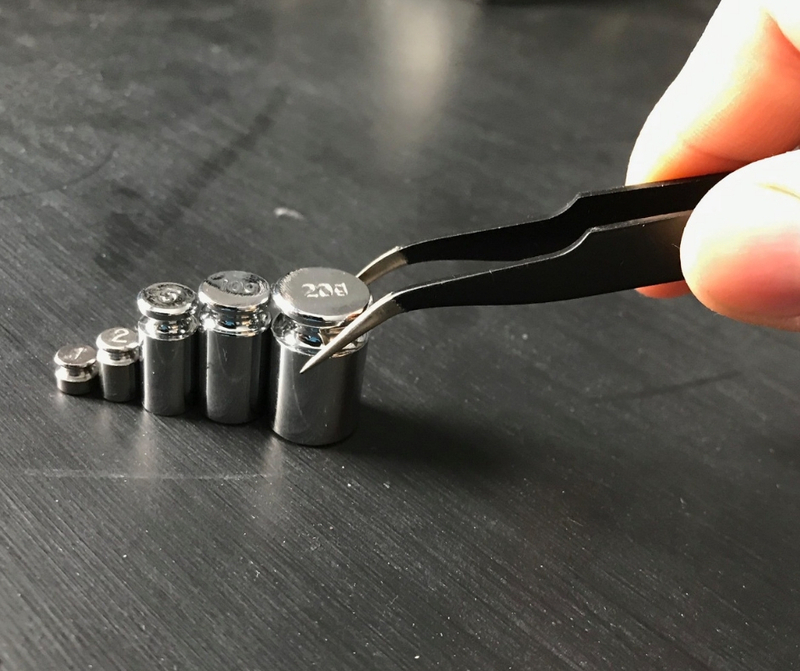 And because of its generous features, it does require more batteries than many of the other scales on the market (four AAAs instead of two) . Bottom Line: If you don’t mind the extra investment, the OXO Good Grips 11lb gives you all the bells and whistles and can make BLE an easier and more enjoyable experience. Now that you’ve explored a variety of features and options, you should be better equiped to choose the Bright Line Eating food scale that is right for you. Whether you choose big or small, your food scale can become your magic wand that helps you work toward a life that is happy, thin and free.